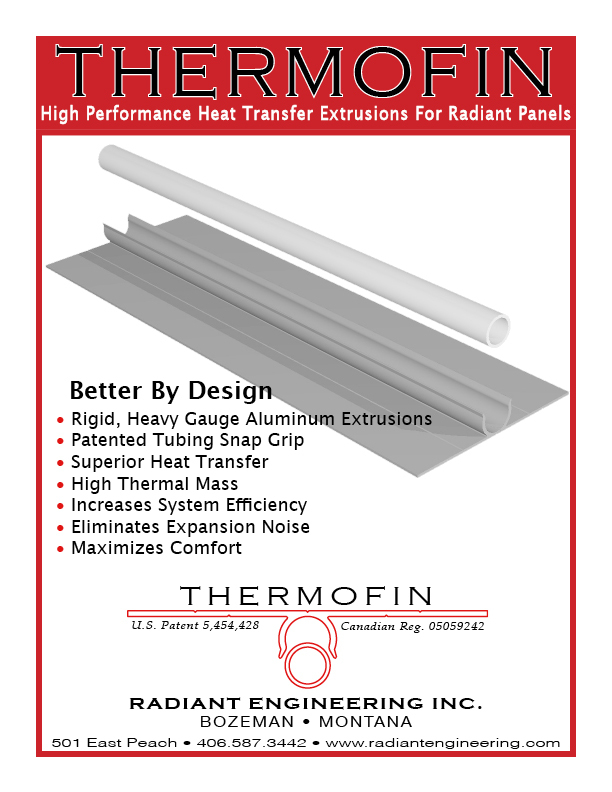 TFinU — Radiant Design & Supply, Inc.
ThermoFin U is a rigid, extruded aluminum plate designed to facilitate heat transfer in radiant floors. The extrusion holds radiant (PEX) tubing securely in the patented snap channel, without additional fasteners or adhesives. This tight fit eliminates expansion noises and provides excellent heat transfer unmatched by thin sheet metal plates, board products or gypsum and cement pours. ThermoFin U is intended for installation above the sub-floor, with the snap channel facing down. Plywood sleepers are placed over the fin between the channels to provide a solid nailing surface for installing the finished floor materials. Install perpendicular to the direction of nailed flooring. Click the Spec-Data image for PDF with specifications. Tubing Return Bends made of MDO are priced per bend. Contact us to have prices emailed to you. Available as single bends and sleepers of bends up to 8’ lengths. See return bend photos below. ThermoFin U Installation Over Wooden Sub-floor Instructions - CLICK HERE to open PDF graphic. ThermoFin U Installation Top View Instructions - CLICK HERE to open PDF graphic. Installing a radiant heated floor on concrete using ThermoFin U - CLICK HERE to open instructions in PDF. We use our CNC router to precision cut Return Bends from Medium Density Overlay (MDO) plywood. This full dimension, waterproof plywood is paper faced, double pressed for flatness, and fully compliant with California Air Resources Board requirements for formaldehyde emissions. This material resists job site abuse, presents a flat and dry surface for finish floor installation and holds nails, screws and other fasteners securely. Return Bends for installations using 1/2" nom. tubing, (5/8" od), are cut from 3/4" plywood. Return Bends for installations using 3/8" nom. tubing, (1/2" od), are cut from 5/8" plywood. We stock Return Bends to produce floor heating layouts for 6" and 8" On Center tube spacing. The tube spacing can be adjusted in a single layout to manage heat loss, accommodate room sizes and produce optimal installations that always have a heat transfer element where your feet are. We cut the plywood down to the last ply, leaving the center in place. These strips can be easily mitered to 90's, 45's and 22.5's in the field to produce high performance tubing layouts custom designed for each project. In a typical installation we recommend that the Return Bends be installed first, then the tube & fin, with the sleeper material placed on top of the ThermoFin U heat transfer plate. This configuration is the easiest to install and produces the friendliest, flat and dry surface for the finish floor installation of choice. The plywood provides solid fastener holding for hardwood floors and a flat, paper based surface which adheres to mortar and securely holds tile backers such as Schluter-Ditra for ceramic tile installations. We also produce MDO sleepers with shallow, recessed rabbet cuts to accommodate the thickness of the ThermoFin-U. This allows placement of the ThermoFin above the sleeper and directly below the finish floor. This is the configuration that is used to produce radiant walls and ceilings as it permits the tubing to be installed last, after wall or ceiling board insulation (if any), and after the plywood sub-forms but before the installation of the finish wall or ceiling finish material such as sheetrock. In floor heating, installing the fin above the sleeper and the tubing last can produce very high heating performance due to the proximity of the heating elements to the finish floor surface. However the exposed heavy plates can be somewhat less friendly to the installation of the finish floor. Such systems can also be slightly more difficult to install, as the plywood grid must be installed before the ThermoFin and tube. In a typical wood floor installation, we recommend that the Return Bends be installed first, then the tubing and ThermoFin, with the sleeper material placed on top of the ThermoFin U fins against the sub-floor. The plates should be perpendicular to the direction of the wood floor. If the finish floor is tile or stone, you can install the return bends and sleepers, then the ThermoFin and tube with the fins up toward the tile or stone. Mud-in over the sleepers and return bends under your tile flooring installation. Lock the PEX in the return bend with Fix-It-All, QuikRete Fast-Setting Underlayment, or QuikRete non-shrink grout. Under wood floors, the fins are down against the sub-floor. Under tile or stone, fins are face up, mud-in gaps. Return bends for PEX tubing and ThermoFin U heat transfer plates by Radiant Design & Supply - buy individual bends or a strip up to 8 feet long. The finish flooring will come later in this home owner's project. They installed the radiant heating and moved furniture back in until the flooring installation. DIY is a process! Wood floor installers should use nails that will not penetrate the bottom of the sub-floor. Use ThermoFin, a better heat transfer plate for your installations. ThermoFin will give you better heat transfer, using lower supply water temperatures, which in turn leads to lower fuel bills. The above is an installation of ThermoFin U showing the return bends and PEX, before plywood sleepers are installed. The plywood sleepers are installed between the plates for a surface friendly to the flooring installers. An infrared camera shows the radiant heat from ThermoFin U plates in this music room. See Radiant Engineering's channel on Youtube for more videos about our products and services.